Good News or Good Grief: Is Sharing Christ Pushing My Faith on Others? Finite or Forever: Is There a Heaven? Divine or Disaster: Why Do Bad Things Happen to Good People? When bad things assault us, they shout large questions to our heart. Questions that begin with “Why,” How” and “Who.” And frequently our heart is at a loss for words. So, in this half-hour, Ron Moore will provision our soul with words of comfort and reason. Guru or God: Is Christ the Only Way? Evidence or Invention: Does God Exist? Among the countless questions we ponder during our lifetimes, some tower larger than others. Some so huge they obscure the horizon. Some so important that eternity hangs on their answer. Today, Ron Moore addresses one such question. In his answer you’ll find a “best friend forever” and ever. Easter, the holiest day in the Christian calendar, is less than sixty days away. To help prepare your heart for this celebration Ron Moore has composed a challenging devotional titled Relent. As you meditate on the thought-provoking reflections there, you’ll draw closer to Christ and sense His Spirit stirring your soul. In Relent you’ll discover the power of surrender, in the life of Jesus and in yours. 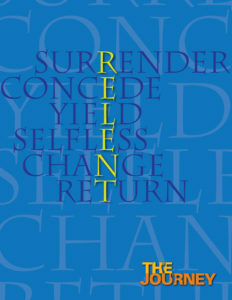 Relent can be yours for a donation of any amount.